Academic Status: 1st year, Class 11 Age: 15 Blood Type: AB Affiliation: Swimming Club. 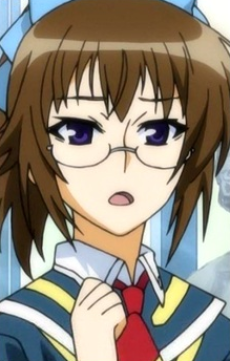 Previous is Medaka's Student Council The Student Council Treasurer. She is originally the ace of the swim team, befriending Yakushima (the swim club's captain) and Tanegashima (the swim club's vice captain). All three had an incredible obsession with money for personal reasons and want to gain enough money to fill a pool and swim in it. When Kikaijima was a child, her father left because the family was in debt, and her mother became sick from working herself in to the ground. All the people that Kikaijima had thought were friends left her because her family had no money. Kikaijima believed that "anyone would be sad if they lost their wallet, but if we died, nobody would care." Medaka corrects her by saying that if they died, she would be sad for them. Afterward, Kikaijima is recruited as the treasurer, and is the only member of the group who is paid for her job. Though Medaka successfully reforms Kikaijima from her old ways, it still does not keep her from being obsessed with money. Shortly after she joins the Student Council, she charges Zenkichi for accidentally seeing her changing and then again for insulting her and one last time for saying she had a great body. She develops strong relationships with the Student Council members, particularly Medaka and Zenkichi, after being encouraged by Yakushima and Tanegashima to make friends outside of the swim club. Like Akune, she is regarded as a "special" and is one of the school's many scholarship students. Kikaijima has an incredible lung capacity, allowing her to hold her breath for a month if she chooses. She can also focus her voice as a sound cannon and destroy physical objects with ultrasonic shrieks. Ten years later, Kikaijima reunites with her friends on the tenth anniversary of Ajimu's disappearance. Changing in the Student Council office with the other women, she is startled by the sudden arrival of Zenkichi and Kamome Tsurubami. As Akune talks with the others, Kikaijima approaches him, stating that her infant child Mogami will play with his toys when he is older. She hands her son to Zenkichi, expressing her desire for Mogami to grow up to have a strong will like Zenkichi. She explains his name means "best", to signify that he is her most important treasure. Though her surname is no longer Kikaijima, she states she is still called as such at her workplace. She discuses the other members of the Swimming Club and Nabeshima, noting that Nabeshima was the only member of their generation to achieve international status.At some point, Kikaijima takes Mogami back from Zenkichi. She falls silent as the others discuss the missing Kumagawa.